As I planned to cook pasta with minced meat and tomatoes, I had the sudden brilliant idea to add our chipotle sauce to it. It was really YUMMY! 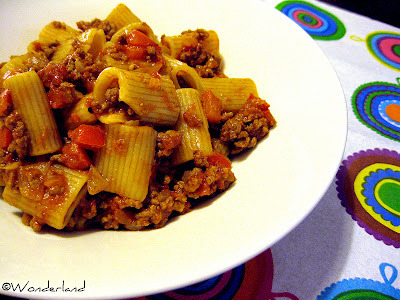 HINT: With this kind of rich meaty sauce I suggest using either some short thick pasta or spaghetti. Wash and slice the bell pepper in small pieces, removing the white parts and seeds. Chop onion and garlic finely and saute it in a saucepan with oil over medium heat. When it becomes soft, add the bell pepper. Let it cook at vivid flame for about 5 minutes so it releases much of the water and becomes softer. Add minced meat, salt and pepper. Mix and cook until the meat turns brown, then pour the tomato sauce and a ladleful of warm water. Cook for 5-10 minutes so the sauce gets thicker, stirring time to time. Add chipotle sauce and chili flakes up to taste, salt, pepper. Sprinkle with paprika powder and oregano. Put a pot of salted water on to boil. When the water boils, add the pasta and cook until al dente. Mix the pasta with the sauce and serve with lots of parmesan cheese.